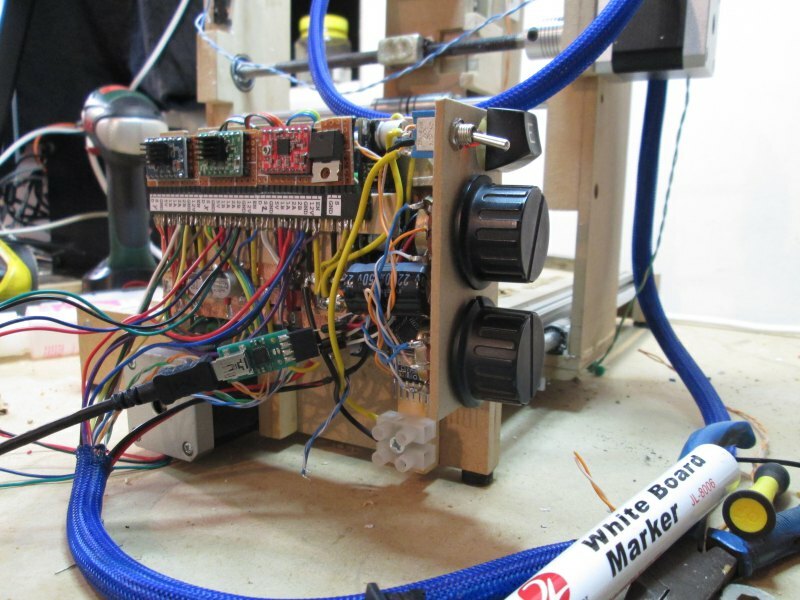 No stepper motor drivers – I used them all on my 3d printer, and then blew them all up! The spindle doesn't run very well – something is slightly out of alignment and so the whole thing makes a lot of noise and draws a lot of power. 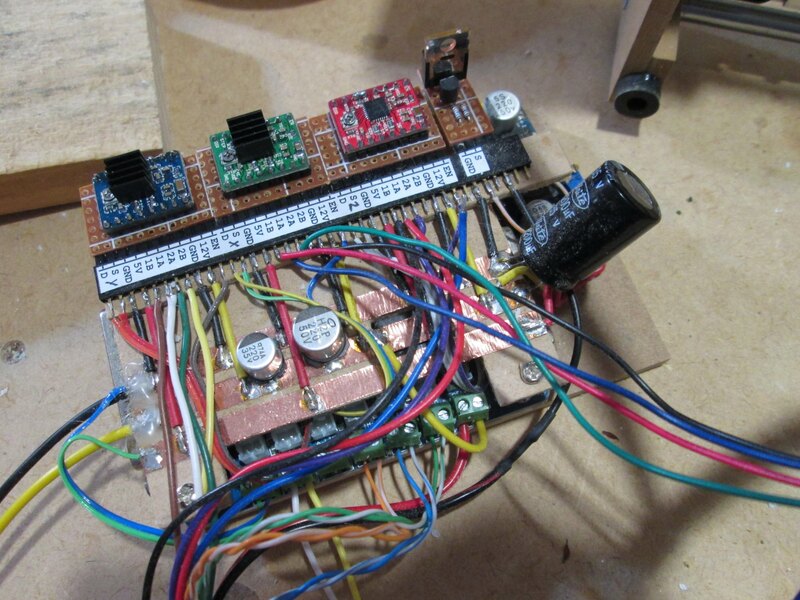 The stepper motor drivers have been replaced so that part is fixed. While I was at it, I decided to clean up the controller board. 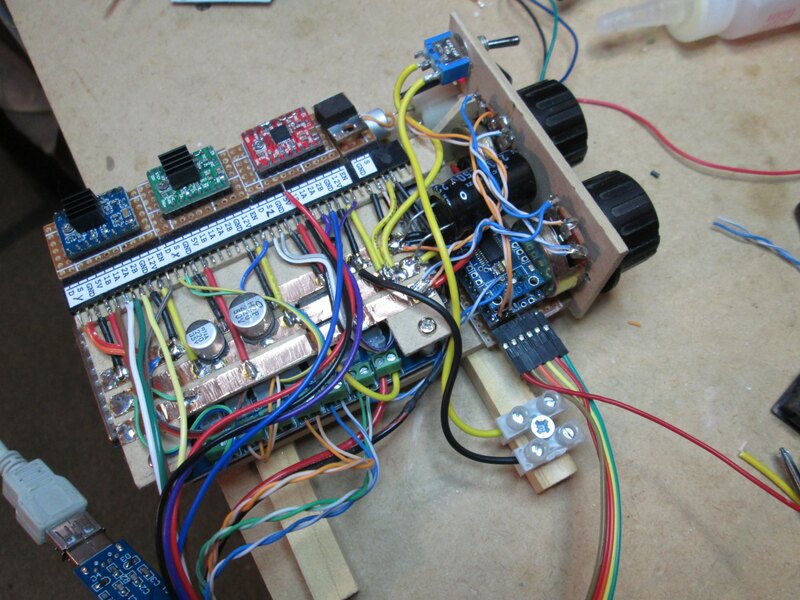 Here is what it looked like beforehand – wires and hot glue all over the place. I decided to mount the board to the end of the machine. This would keep the controller off the bench and the wires nice and tidy. 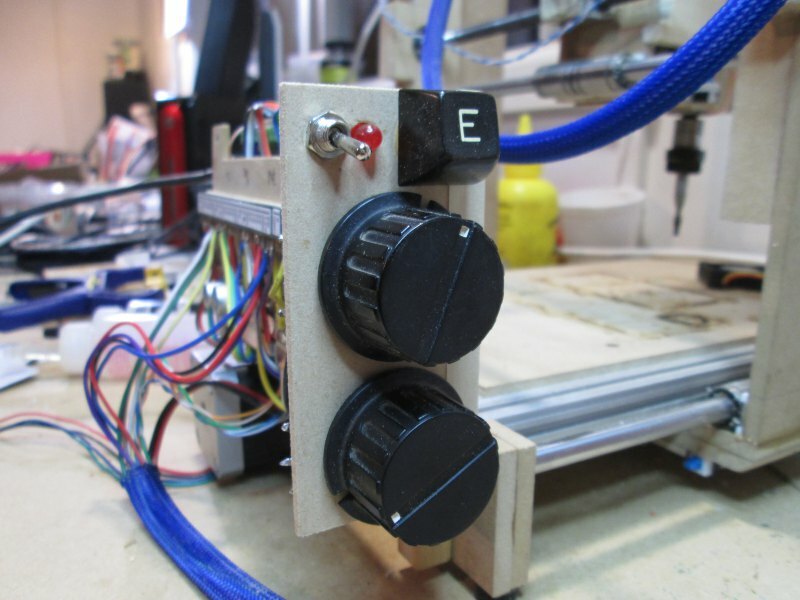 I also opted to add a small control panel to hold the power switch, emergency stop button, a power LED, and two speed control knobs: one for the spindle speed, and one for the feed rate (how fast the machine runs through its program). I cut out some wood and made a new base for the controller, then glued and screwed it on. For the control panel I made a quick mock up of what I wanted and then set about cutting and drilling. The E switch is an interesting one; it came form an original BBC micro computer that I somehow acquired many many years ago. Each key had its own mechanical switch underneath and I've still got most of them floating around in one form or another. It's a shame I don't still have the Beeb, but I don't think it was working when I got it, and I didn't have the know-how to make it work. These days it'd be an interesting project to tackle, and I suspect a working BBC model B would fetch a pretty penny. Instead it now lives on as the emergency stop button on my CNC machine! To make the knobs work I used an Arduino and TTL USB/serial adapter. 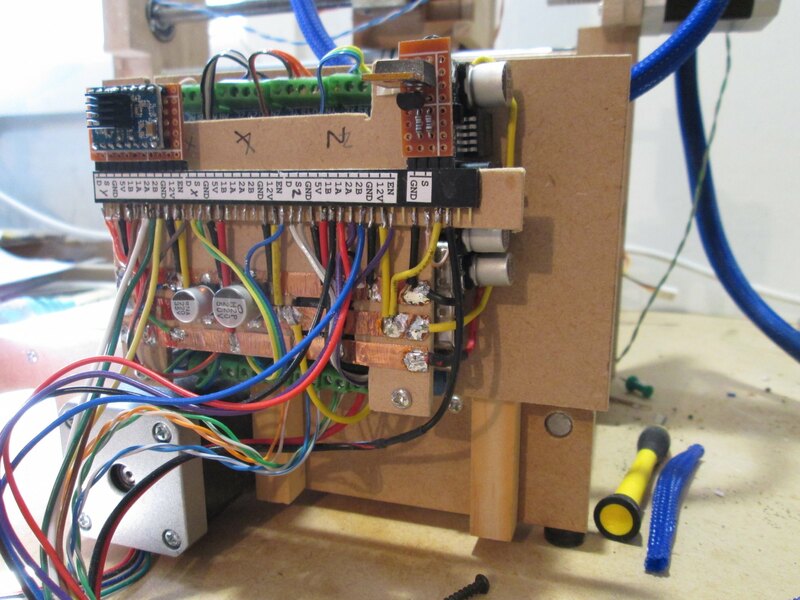 The Arduino reads in the knob position, converts it to a number, runs a smoothing process on the data, and spits it out to the computer if it has changed. A total overkill for the ATmega168, which has 8x the clock speed of a BBC micro, 1/16th the RAM, and nearly the same number of pins. So what formed an entire computer back in the day, is now monitoring just 2 knobs. Why? Well it's what I had on hand. I shoehorned the whole thing into the available space and wired up the E-switch, power LED, re-routed the power lines, etc. I quickly whipped up a program on my PC and attempted to program it. I ran into some USB device permissions which meant I had to take a bit of a circular route to program it, and the TTL USB adapter didn't work well enough for me to program it over serial. Luckily I have a USBasp programmer for just these occasions and it quite happily programmed my board for me. Where I ran into problems was getting serial to work. It seems that the FTDI TTL USB adapter I had is broken. I had a sneaking suspicion this was the case, and after a fair bit of fiddling I decided that was definitely the case. Into the bin it goes. I looked on TradeMe for a replacement but they started at $20, ex shipping... on eBay I can get a 10 pack for that price, including shipping! So I jerry-rigged a spare adapter in place and suddenly everything started working. Now I just need to write the Python end of things. I found some code online that will do what I want, though it is hideously overcomplicated... I suspect I can replace their 1000s of lines with about 50 lines. Then I just need to tidy up the wiring, give it all a clean and test, and do something about that spindle. One possible solution is to make a Dremel mount.